Landscape design isn't really a single design discipline. Landscape designers and landscape architects must integrate a series of design elements to produce a coherent end product. Urban design firms usually have even more design elements to take into account when producing and executing their design work. Urban design often has more existing structures to work around than other types of landscape design. In addition to producing a livable, practical, and aesthetically pleasing outdoor space, landscape designers also have to plan for the future more than other design professionals. Architects don't need to worry about their buildings moving around, but a landscape architect must plan for the growth and maintenance of plantings. That makes landscape design partly art, partly, science, and a little bit of fortune telling. It's important for landscape designers to be able to identify the objects and plants that will have a major effect on the landscape. Good design should feel uncluttered. This is especially true of urban designs. Producing an urban oasis requires simplicity to function as an alternative to cluttered urban landscapes. Keeping it simple doesn't mean that landscape designs have to be boring. By tastefully mixing forms, colors, and textures, landscape designers keep things interesting without being chaotic. Good landscape design allows the eye to keep finding new things to look at, but doesn't overwhelm the viewer. Many urban design firms use water features to introduce motion in very tight spaces, for instance. This is restful to the eye, but constantly changing to avoid boredom. Urban street scenes feature abrupt changes. There's a lot of difference from the street to the sidewalk, and from the sidewalk to the facade of the building. Transitions are usually little more than seams. Landscape design uses gradual transitions between design elements to produce a sequence. 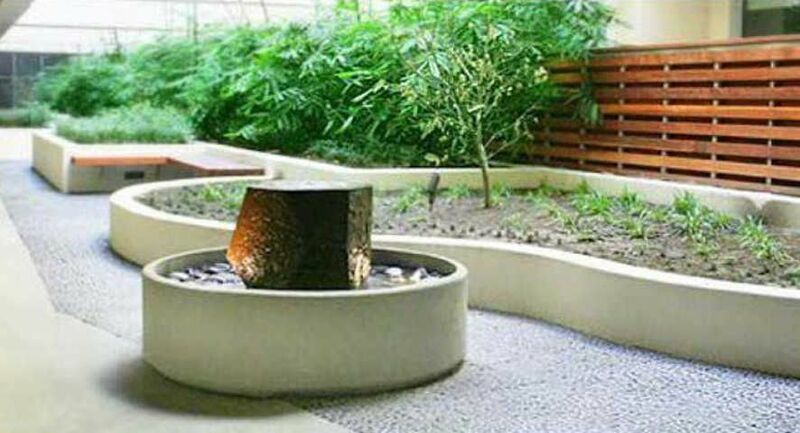 By avoiding abrupt changes, landscaped areas can be more soothing and inviting to users to visit and linger. This sequence is also useful to lead visitors to desired destinations in the design. Balancing elements in a landscape design is tricky. Opportunities for symmetry are rare. Landscape designers are required to give a lot of attention to massing and balancing disparate elements to achieve a visual balance. This is further complicated by the need for variety. Scale doesn't just refer to the size of one part of a landscape. The ratios of the sizes of all the landscape design elements determine how a visitor will experience the landscape. There isn't a single "correct" scale for landscape design, either. Landscape designers must determine whether to use anything from small scale to monumental scale plans, depending on the surroundings. They must also take into account the growth of plants and trees over time. In good landscape design, plants and structures are placed in groupings that lead the eye from one place to another. Some plants or surfaces look great as groups. Examples of hard and soft groupings could be ground cover and paving stones. Many small elements are massed to give an effect. Emphasis can come from these massed units, or from accents and single specimens. For instance, a statue in the center of an urban oasis draws the eye to a single point. Accent plants have special characteristics that make them stand out in the crowd of other vegetation. Landscapes require all these design principles to make pleasant places for visitors to enjoy. Each is important in its own right, but none is more important than any other. It's up to the landscape design company to integrate all of the principles into a coherent whole to achieve a truly memorable landscape design.